Dr. Judy Morgan’s Cat Cave is a Must-Have Product for Cats! Like most cats, my kitty (Lola) loves to hide. This wool cat cave from Dr. Judy Morgan makes for an ideal hiding space for cats! Since we purchased it a few months back, Lola has been using the cat cave daily. She enjoys snuggling up in it for a nap and loves hopping in and out of it while she’s playing. It’s been such a hit! I love that the wool is handmade and is free of chemicals and synthetic material. It’s also eco-friendly, which is a big plus in my book! We did wash and air dry it a few times already and it is still in perfect condition. The product description mentions that it’s made from breathable wool, which provides plenty of room for air circulation. Because of this the cave is suitable for use in both the cold and hot season. Lola would agree because she has used it in the winter and summer months. When Lola is not in the hiding mood, the cave can be flattened and used as a bed instead. She likes to lay on the bed while looking out of our bay window. It’s the perfect hang-out spot! This is a unique, fun and versatile product that all cats deserve to play, snuggle and lounge in! 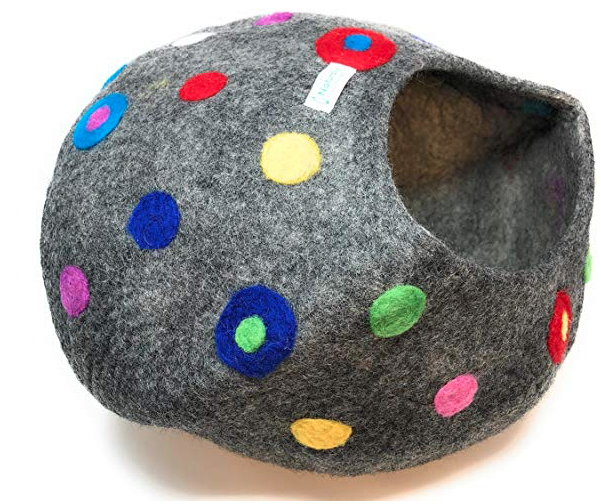 This entry was posted in Product Review and tagged Dr. Judy Morgan, wool cat cave on April 2, 2019 by Rebecca Symon.